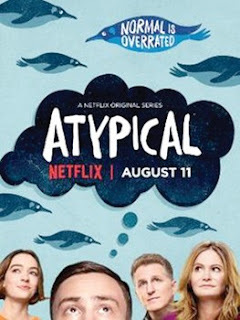 The most recent series that has me hooked is “Atypical”, a story about 18-year old Sam (Keir Gilchrist), who is on the autistic spectrum. Each show in the first season follows Sam as he searches for love, trying to fit in and to be “normal”. Sam is certain that he loves his therapist, Julia (Amy Okuda), but upon realizing he can’t share his love with her, decides to have a “practice girlfriend” with fellow high school student Paige (Jenna Boyd). Paige, who may be on the spectrum herself, sees past Sam’s quirks and really seems to like him. Sam lives with his mother, Elsa (Jennifer Jason Leigh) who is overprotective, ultra-organized and also seems to display behaviors from the spectrum. Sam also lives with his father, Doug (Michael Rapaport) who does his best to be a good father, trying to make up for the time he left Sam, his mother and younger sister, Casey (Brigette Lundy-Paine.) Casey toggles back and forth between being gruff with her older sibling or being a loving and protective sister. Sam and his family are each dealing with their own demons and changes, proving that there really isn’t any such thing as being normal. Although I have worked with children on the autistic spectrum, I often wonder if the show accurately portrays the life and behaviors of those on the spectrum. With that being said, know that the two-season series may fall flat for those who know the ins and outs of living with autism, it does offer a bit of humor and reveals, if only slightly, the life of those touched by autism.